Crate training Chihuahuas is not as hard as it sounds. Using the advice in this article you can have your Chihuahua crate trained in no time! Read on to find out more about crate training Chihuahuas. Will Your Chihuahua Enjoy and Like Their New Crate? You may worry that your Chihuahua will not like their new crate. For your peace of mind, it is good for you to know that most Chihuahuas end up loving their crate! It is part of a dog’s nature to find a small, safe place to sleep in as this helps them feel protected. So by giving your Chihuahua their very own crate, you are making your Chihuahua feel protected and safe in your home. The sooner you introduce a crate to your Chihuahua, the sooner they will get used to it. So start crate training Chihuahuas from when they are puppies. Never ever allow your Chihuahua to be on your bed. 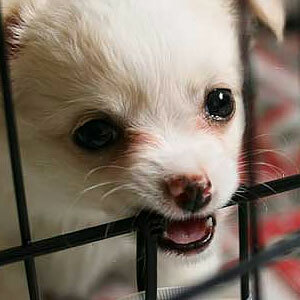 If you do allow them to do this then it will be extremely hard to crate train your Chihuahua at a later stage. The best location for your Chihuahuas crate is in an area where there are lots of people. This could be your lounge or study. During the evenings move your Chihuahuas crate to your bedroom. This will make them feel safe during the night. After a few weeks you should be able to just leave the crate in one place and won’t have to move it to the bedroom in the evenings. Make sure you have a comfy mattress, blanket and a few toys in your Chihuahua’s crate. Also ensure there is plenty of water for them. Your Chihuahuas crate should be big enough for them to move around in but not too big so that they can walk a big distance. If the crate is too large then your Chihuahua may end up going to the toilet inside. When crate training Chihuahuas, they may get upset and bark or wine. If this occurs, do not take your Chihuahua out of the crate and give them attention. If you do this your Chihuahua will relate getting upset in the crate with being removed from the crate and given attention. So, if your Chihuahua does get upset, do not remove them. If they are quiet for five minutes you can then take them out and show affection. Soon your Chihuahua will associate being quiet in the crate with affection and they will learn to not make noise while in the crate. When first starting Chihuahua crate training you should only leave them in for a short amount of time – such as two hours maximum. As your Chihuahua gets older you can start increasing the amount of time. When you feel your Chihuahua is used to their crate, you can leave them in for a whole night. By giving your Chihuahua a crate you are giving them a safe and private place. This will make your Chihuahua very happy and they will become a great member of your family. So take the advice in this article and start crate training Chihuahuas today! .